Just as the name implies, the Sweet Charlie Strawberry plants tastes like they have sugar on them fresh from the field. Sweet Charlie Strawberry plants are vigorous, disease-resistant, and produce large firm strawberry fruit. Plus with their natural sweetness, this is a favorite for dessert strawberries. Plants are medium in size making for an easy harvest. The Sweet Charlie Strawberry plant is an early season, June bearing strawberry variety. Zones 4 - 8. 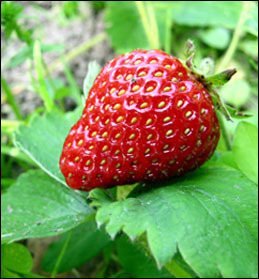 June bearing strawberries produce a single crop each year during a 2 - 3 week period. TIP: If you get blooms the first year while the plant is getting established pinch the blooms off to ensure a large fruit crop the next year. Also available in pots are Chandler Strawberry Plants. Buy Sweet Charlie Dessert Strawberry Plants Online at GreenwoodNursery.com. Only the Bare Root Plants can ship into California.